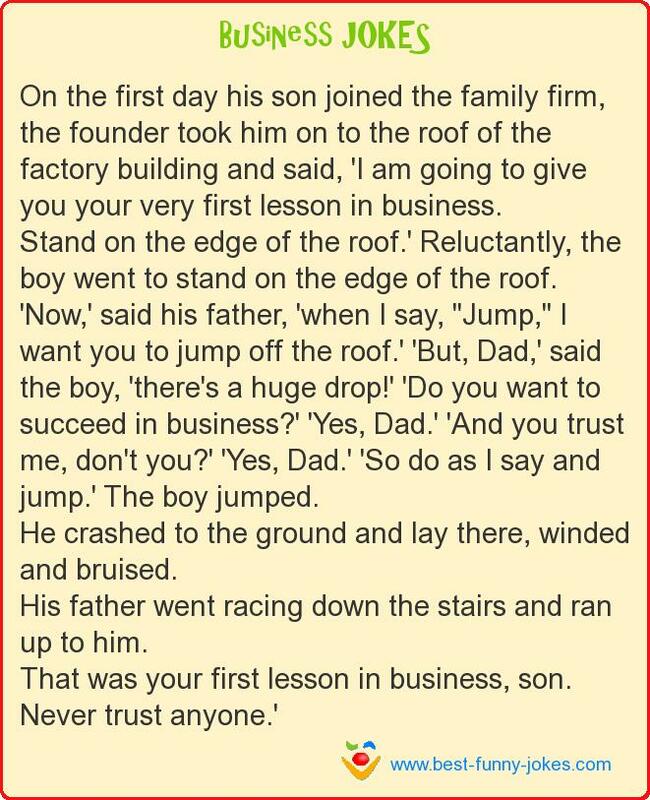 On the first day his son joined the family firm, the founder took him on to the roof of the factory building and said, 'I am going to give you your very first lesson in business. Stand on the edge of the roof.' Reluctantly, the boy went to stand on the edge of the roof. 'Now,' said his father, 'when I say, "Jump," I want you to jump off the roof.' 'But, Dad,' said the boy, 'there's a huge drop!' 'Do you want to succeed in business?' 'Yes, Dad.' 'And you trust me, don't you?' 'Yes, Dad.' 'So do as I say and jump.' The boy jumped. He crashed to the ground and lay there, winded and bruised. His father went racing down the stairs and ran up to him. That was your first lesson in business, son.